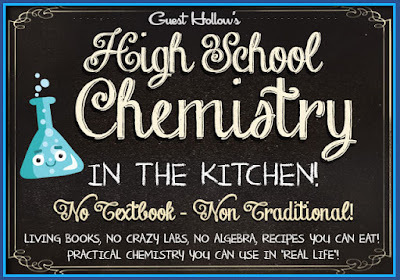 A RUP LIFE: Guest Hollow's High School Chemistry in the Kitchen #Review & Giveaway! Guest Hollow's High School Chemistry in the Kitchen #Review & Giveaway! I've always been intrigued by using living books in our homeschool. There are a few expensive curriculum companies out there that I always drool over but honestly I wasn't sure I wanted to make that kind of budget commitment if it didn't work out for my kids. When I stumbled upon Guest Hollow's new High School Chemistry, I couldn't stop looking at the site. I drooled over the real life books and even made a wish list on Amazon. I looked over the sample weeks and I discussed it about a millions times with my husband and two high school students. You see this is exactly the type of curriculum I was looking for because it had a difference from those other literature based sciences I always wanted to try. It was updated and modernized with the addition of online resources and videos. This combined the best of two worlds by using real living books and our computer. What exactly is Guest Hollow's High School Chemistry in the Kitchen? What you are getting from Guest Hollow when you purchase is a 36 week high school level course. You will have the complete schedule (both printable and online version). The schedule includes all the reading assignments, videos ( links), activities and experiments. 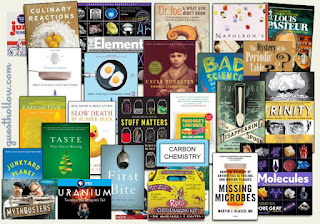 Basically Guest Hollow has done all the leg work on finding the right books, videos and experiments to make a complete course. This is not your traditional Chemistry because you are not focusing your time on a straight textbook but rather it is more interactive and practical learning. It focuses on the use of living books along with videos and online resources. It also doesn't bog students down with a bunch of worksheets or math related situations. Books. You will need access to the books for this course. You can buy new, used or even use your library. For us I went ahead and ordered the bulk of them used. I find it easier to just have things on hand but I did look at my local library and they had many of the books as well. Ingredients. You will also need ingredients to complete recipes and experiments. Most are easily found at your grocery or things you probably have on hand like a thermometer. There are a few specialty things like a soap making kit (I actually have all the stuff on hand for this) and a whip cream canister (we are kind of ridiculously excited to buy and use this one!). Internet. You will want to have reliable wifi so you can easily watch the videos. I have two high school students this year - 9th and 11th. Both of them will be working together on this course. With it not being heavy in the math department it allows my younger son to be able to join in. (He will do biology next year.) They share the books and watch all the videos together. I've posted the weekly schedule on my computer station and we highlight completed work when both have finished. I will most likely be doing some of the experiments with the students as they are not super confident in the kitchen but as we progress I imagine that will change. Each student will have their own printed list of work as well to be able to check off progress. I have been texting them the videos each day out of convenience but for some we will watch on the big television in the living room as a family, things like Mythbusters. So far there are not any set test in this curriculum but I plan on doing some verbal testing and making up small quizzes on some of the reading material. I will also give credit for each of the completed projects. They will keep a general notebook with all the recipes and findings for experiments for credit. Overall this will work well to be able to give full credit for high school science. Speaking of credit because this course is non-traditional I plan on counting it as a history of food credit. Guest Hollow addresses grading here and credits here. 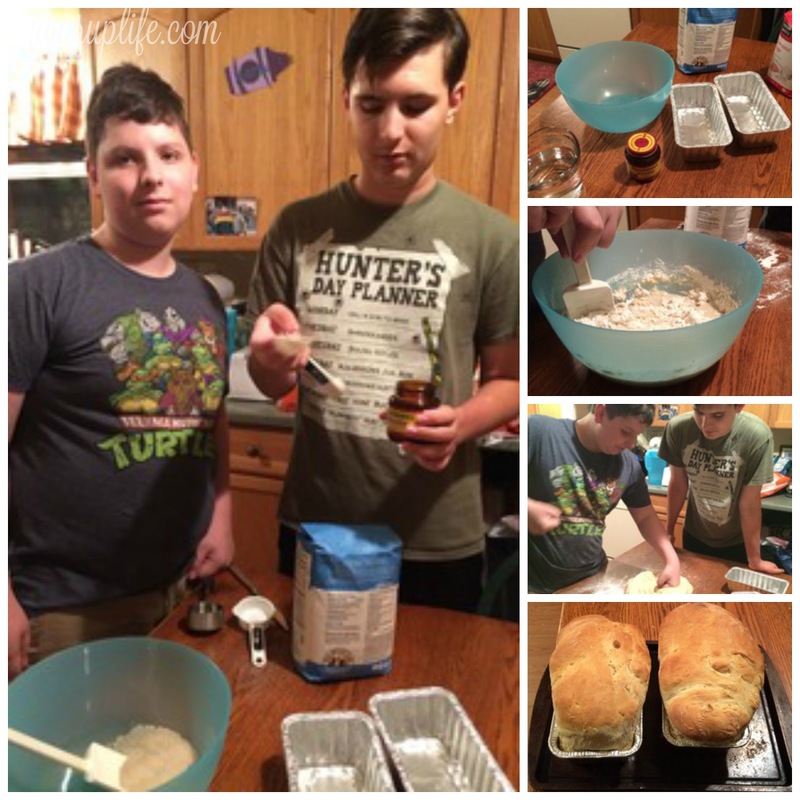 One of our experiments from the first week was making bread. We talked about "proofing the yeast" and letting the bread rise. They also learned how it is important to follow directions. This was a enjoyable activity for all of us. I just loved watching them work together, having a blast and learning. I've caught both of my children reading their textbooks outside of our school time. This is a rare occurrence at our house because they much rather read their non-school books during the summer. Having teen boys give their opinions on school is always interesting. However, I'm happy to report that they are very much intrigued by this curriculum. I do take their thoughts into consideration when picking out their workload because ultimately they are the ones having to complete the work and it will be a struggle if they don't like what they are doing. With this being a product review they had the choice at the end of the first week to tell me that they wanted to move away from this type of learning and back to a traditional textbook style and both said they wanted to do this for the upcoming year. I have to say I thrilled. I can see how this will be fun to do with all the activities. It will also be a nice break to only read a bit from each book each day. The schedule is broken up in to very doable chunks. I also like that this informational way of learning will give them real world knowledge of actual chemistry topics. They will cover all the basics but in practical ways that will help them understand the world. I often hear from my boys, "Why do I need to learn this?" With Guest Hollow they can see how the information relates to the real world and understanding it. I'm super impressed and can't wait to dive in this fall! Please visit GuestHollow.com for additional information. They have really answered many questions plus you can see sample weeks. ARupLife.com received product, press or compensation to facilitate this review. This post may contain affiliate links. We only give our honest opinions of products. This post is in accordance with the FTC 10 CFR, Part 255 concerning the use, endorsements or testimonials in advertising. *Giveaway includes the curriculum from Guest Hollow, you will need to acquire the living books via purchase or library and have internet to complete this course. Four elements are named after a town in Sweden -- Ytterby, including yttrium. An element on the periodic table is carbon. Four new elements on the periodic table are named nihonium (Nh), moscovium (Mc), tennessine (Ts) and oganesson (Og). Neon can be found on the periodic table. Hydrogen is an element on the periodic table. The first element on the periodic table is hydrogen. 1 (hydrogen) isthe first on the element periodic table. I prefer silver to gold, unless its platinum. Carbon is one of the many elements found on the periodic table. An element from the periodic table is hydrogen. I'm just wondering if you use this as a 'core', similar to sonlight, or do you use it simply, you as your science component and add history L.A etc? We are using it as a core. I make them write some short papers And orally narrate for additional work and plan on two major tests as well. We also keep a notebook and count the recipes/ hands on projects for grades.